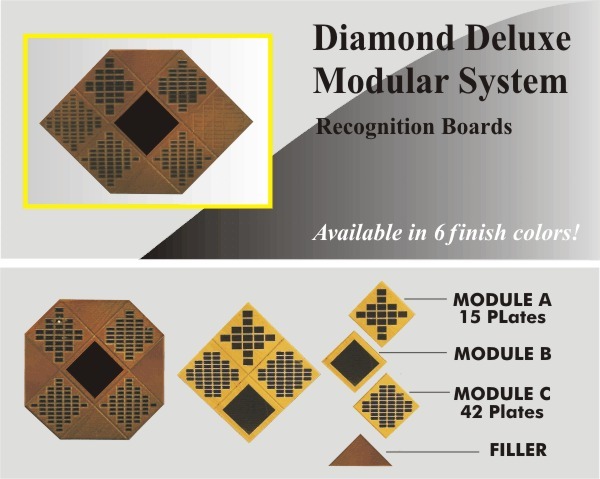 Another popular modular system, the Deluxe Diamond Series allows for versatility in design and functionality. Construction is of the highest quality engineered materials which include 3-D MDF core with a vaccum formed commercial grade cabinet vinyl laminate that is extremely durable and marr resistant. A variety of wood finishes and plate configurations give this series versatility in design and functionality. It is great for recognizing donors and stimulating donor interest, or for any recognition need. Available in six handsome wood finishes, and 3 plate configurations measuring 18x18", the Diamond Deluxe system can easily be added on to in the future. All plates are laser etched "in-house" producing an opaque black, crisp, permanent and easily readable character. Our years of experience in graphic design will assure your text is layed out and imprinted in an eye-pleasing and professional manner. To assure customer satisfaction, before proceeding with any order we e-mail all customers a FREE "e-proof" showing the general text/graphic layout for all plates and header plates.